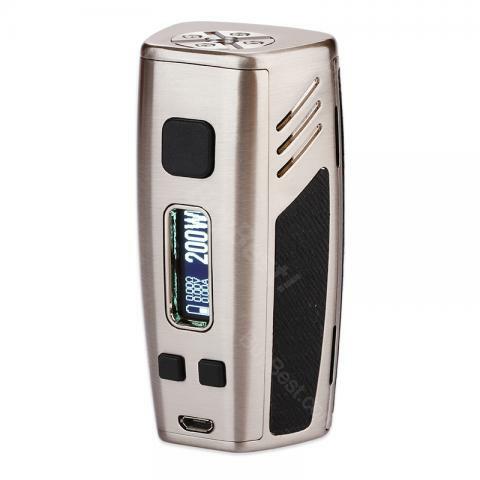 Hugo Vapor HUGO133 is a compact and powerful box mod with ergonomic curved body. Powered by dual 18650 cells, the Hugo133 supports maximum 200W output power with advanced VW/TC/ Bypass/TCR/PTC modes. It supports max 1A USB charging with advanced balance-charging chipset. The 0.91-inch OLED screen will show the vaping info directly. Hugo Vapor HUGO133 is a low profile dual 18650 box mod with massive 200W output power that will satisfy most vapers’ daily demands. The HUGO133 MOD has an elegant ergonomic curved body and offers a super comfortable hand feel. It supports advanced VW/TC (Ni200 /Ti /SS)/ Bypass/TCR/PTC modes and pre-heat function. The stable and smart balancing charging chipset enables maximum battery charging current up to 1A. The 0.91-inch OLED screen will show the vaping data directly. Magnetic back cover makes the battery installing very easy. Grab one Hugo Vapor HUGO133 and start your vaping. Bestellt habe ich am 26.4. Versandet wurde am 27.4. Erhalten habe ich das Paket durch unseren Postboten am 14.5. also knapp 2 Wochen wenn man die Wochenende abzieht. Artikel waren sehr gut und sicher Verpackt. zu dem Hugo mod in diesem Finish liegt sie sehr gut und sicher in der Hand. Langzeit nutzung wird zeigen wie gut. Einfach bedienung 5 klick an und 5 klick in den Stanby modus. 3 klick ins Menu für die Einstellungen 2 klick um im Temp Modus die Watt einzustellen Minus und Feuertaste gedrückt halten lockt den Ohmwert und wenn ich richtig liege ist Plus und Feuertaste sowas wie Powershot fängt bei 1 an und hört bei 100 auf . (Ich sollte die Bedienungsanleitung lesen) Es könnte auch der TCR Modus sein siehe letztes Bild. Die Box bringt mich bei 30 Watte über mehrere Tage. bonjour,je souhaiterai savoir si ma box est en cours de livraison,merci de votre réponse,cordialement. I haven't tried TC mods before. Hugo133 seems pretty simple to use. Working great with my atty. My husband needed a new box mod, so I thought hugo133 mod would be a nice gift for him. And yes he totally love it. buybest has so many cool stuff here. Everything well packed and works well. And the prices are good. Definitely will recommend this store. It take a bit long to arrive, I like the hugo vapor mod and appreciate their service though.